Amanda White and I, aka the duo of “Family Movie Moms”, finally made it out of our houses to watch some new movies. We even took the time to record our conversation about them to help y’all decide if either movie is a fit for your families. AND just in time for the holiday break, we are reviewing the top two movies last weekend. Are you planning to see either one? 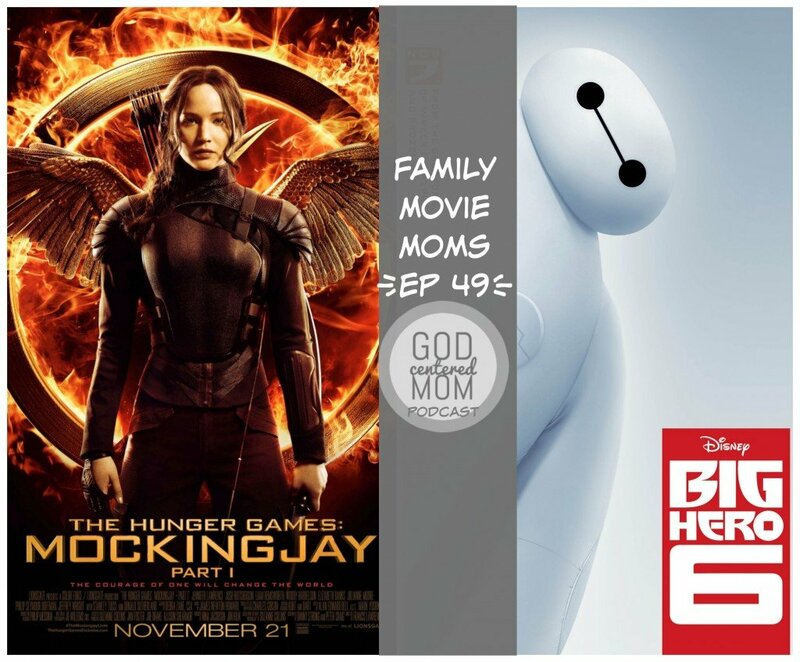 On today’s episode, we share insights, warnings and discussion points for a couple of movies–Amanda on “Mockingjay: Part 1” and Heather on “Big Hero 6”. As a bonus, we share some oldie-but-goodie movies we each watched at home (thanks to sick kids, family movie nights and the church library). Amanda’s Family. . .Lady & the Trump, Peter Pan, Beauty & the Beast. Heather’s Family. . .Cheaper by the Dozen (Steve Martin) & The Absent-Minded Professor (old version). Imagined what it would be like to make a living as a full-time movie critic. What age should kids be to see Mockingjay? (and a tangent about various family movie viewing guidelines). Compared the Capit0l in Hunger Games to America. Main message of Mockingjay: Are you willing to die for a cause? To stand up against evil. Asking your kids, what would they sacrifice? What do they feel God’s asking them to give up and cause some discomfort for a greater good? The results from Amanda’s Facebook poll on the age kids are seeing Hunger Games movies. How modest Katniss dressed in the movie. The trickiness of exposing preteens to Young Adult book series. Encouraging families to have a value mission statement, engage in conversation about movies, and filter movies through that worldview. Talking to your child about sacrificial love. . .slow growing love for another. How depressing Mockingjay is and the need for redemption. How Katniss’ hair got on Amanda’s nerves. The low down on Big Hero 6. . .the appropriateness for children. A slightly terrifying (and funny) first scene, but the sweet rescue from the older brother. The themes of death/grief, using gifts for good, positive side of science (and benefits of college), & emptiness of revenge . Reminding your kids that hurt people, hurt people. My favorite character–Baymax–the personal health care provider. Loving your friends through the grief process. What could scare your kids from this movie. . .but how Heather’s boys did not get nightmares. The teamwork element of the Big Hero 6 characters–importance of having a plan. Thinking your way out of a problem, not just feeling your way out. May be a good movie to watch when it comes out on DVD if your young child is sensitive.